Zany Ontario composer Friendly Rich is known for his musical contributions to The Tom Green Show, as well as his many solo albums and those with the Lollipop People, and now he's preparing to roll out a unique new album with a one-of-a-kind tour. 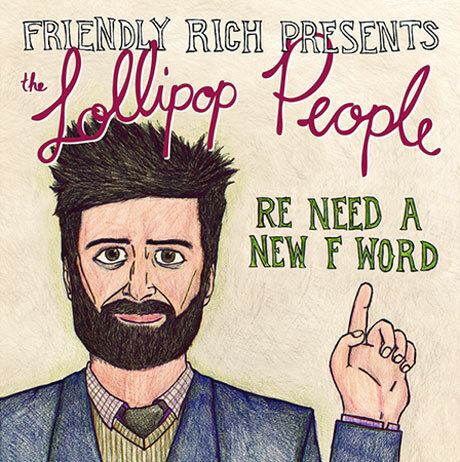 Peculiarly, the new album is called Re Need a New F-Word, and it's a song-by-song remake of his 2006 album We Need a New F-Word. This was recorded with his band the Lollipop People and was produced by Greg "Gerg" Dawson. You can stream the new version of "Where the Baker Sleeps" below (along with the old version, for comparison purposes). The album will be released on April Fools' Day (April 1) at 9 p.m. EDT, when Friendly Rich will unlock a new micro-site (which will be found here) containing the new album, plus 10 accompanying music videos. An announcement notes, "THIS microsite IS the album. There will be no flexidisc. There will be no hand-etched vinyl. There will be no rum-soaked 8 track." To lead up to the release, Friendly Rich and the Lollipop People will embark on a brief tour that will find them playing a single song at 15 separate Tim Hortons locations in Quebec and Ontario within two days. He will also play full evening shows, including a live webcast on April 1 from an unidentified fish and chip shop in Orangeville, ON. This will stream live starting at 7 p.m. EDT and will lead up to the unlocking of the new site. It's a very one-of-a-kind rollout, so check back to Friendly Rich's website for updates.